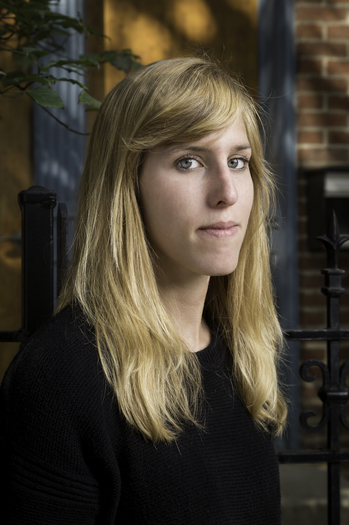 Elizabeth Metzger Sampson is a poet, essayist, and frequent collaborator with visual artists. She's the Executive Director of the Poetry Center of Chicago, which organizes roving readings across Chicago, with established and emerging writers, and hires poets as teaching artists for residencies in CPS. She was named one of Newcity's "Lit 50 2017." She previously founded and edited Dear Navigator, a literary magazine for the School of the Art Institute of Chicago, where she also taught. She has also led creative workshops for artists and writers in Cairo, and Sinai, Egypt. Please join Elizabeth and our other amazing readers on Tuesday, May 1, 2018 in the upstairs bar at Hopleaf. Doors open at 7pm, and the show starts at 7:30. It's free, and 21-and-over. RSVP on Facebook. Felix Jung received his MFA in Creative Writing from The Ohio State University in 2000. His writing has appeared in Crab Orchard Review, Hayden's Ferry Review, and Cassette From My Ex - an anthology of personal essays on relationships in the era of the mix tape. 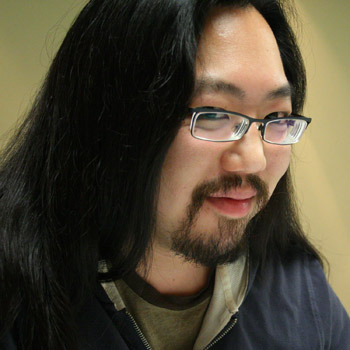 His online projects have been featured on BoingBoing, MetaFilter, and Product Hunt. You can find him on Twitter @avoision, or at his website avoision.com - a personal blog he's updated every single day since July, 2002. Please join Felix and our other amazing readers on Tuesday, May 1, 2018 in the upstairs bar at Hopleaf. Doors open at 7pm, and the show starts at 7:30. It's free, and 21-and-over. RSVP on Facebook. 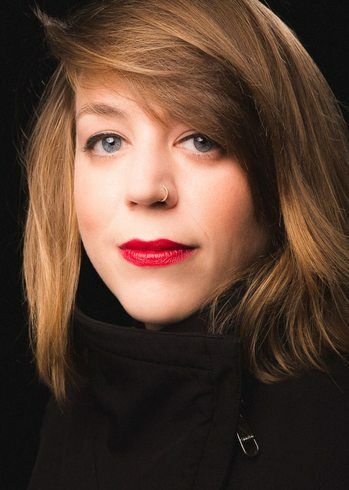 Rachel Z. Arndt is the author of the essay collection Beyond Measure, which came out from Sarabande in April 2018. She received MFAs in nonfiction and poetry from the University of Iowa, where she was an Iowa Arts Fellow and nonfiction editor of the Iowa Review. Her writing has appeared in Popular Mechanics, Quartz, Pank, Fast Company, and elsewhere. She lives in Chicago. Please join Rachel and our other amazing readers on Tuesday, May 1, 2018 in the upstairs bar at Hopleaf. Doors open at 7pm, and the show starts at 7:30. It's free, and 21-and-over. RSVP on Facebook. 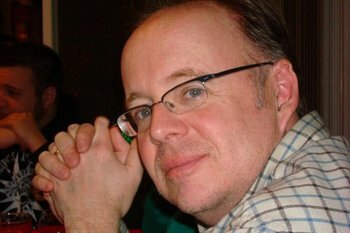 James Finn Garner is the author of the Politically Correct Bedtime Stories trilogy, which will soon be published in the Czech Republic and Turkey. He recently launched the webcomic, Single White Vigilante, about a superhero hitting the lonely stretch of his mid-30s (it doesn't help that he drunk dials the villains he has put in jail). His latest project is the clown noir mystery series starring Rex Koko, Private Clown. These titles include Honk Honk, My Darling; Double Indignity; and The Wet Nose of Danger. Please join James and our other amazing readers on Tuesday, May 1, 2018 in the upstairs bar at Hopleaf. Doors open at 7pm, and the show starts at 7:30. It's free, and 21-and-over. RSVP on Facebook. Michi Trota is the two-time Hugo Award-winning Managing Editor of Uncanny: A Magazine of Science Fiction and Fantasy, and the first Filipina Hugo Award winner. 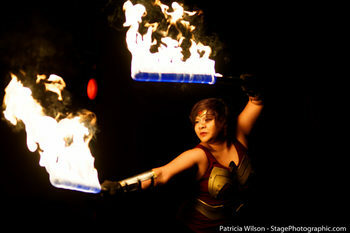 She is an essayist, public speaker, fire performance artist, and serves as president on the board for Chicago Nerd Social Club. Please join Michi and our other amazing readers on Tuesday, May 1, 2018 in the upstairs bar at Hopleaf. Doors open at 7pm, and the show starts at 7:30. It's free, and 21-and-over. RSVP on Facebook. May the weather be milder by then, and may you join us on Tuesday, May 1 in the upstairs lounge at Hopleaf for Tuesday Funk, with readings by Rachel Arndt, James Finn Garner, Michi Trota, Elizabeth Metzger Sampson and Felix Jung. Cohost Andrew Huff gave us five topical haiku on April 3, 2018. Don't like the weather? Just wait. April Fool's, all on one day. 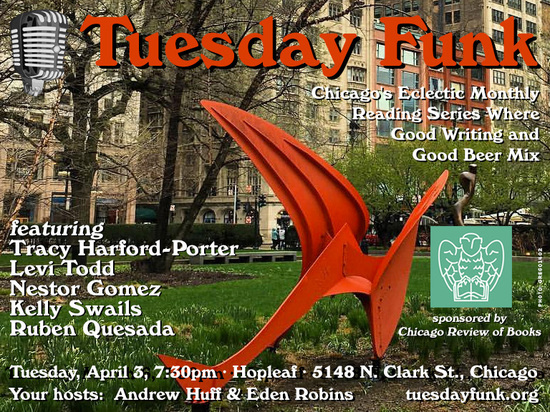 The weather was classically "Chicago in early spring," but your favorite eclectic monthly reading series kept everyone warm and dry in the upstairs bar at Hopleaf on April 3. Kelly Swails started things off with an essay about the change of faith necessary to go from being a Cardinals fan to a Cubs fan. Next, Ruben Quesada read some deeply personal poetry, then Cinnamon Cooper shared a story of discovering freedom as a child in a domestic violence shelter. 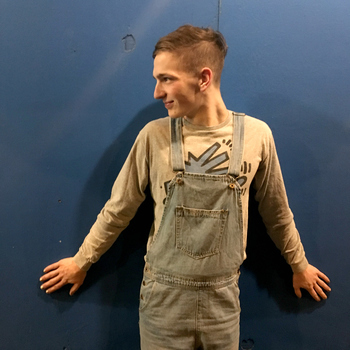 We took a break, then cohost Andrew Huff shared a couple of his patented topical haiku, then Levi Todd recited poetry that both challenged and amused the audience. Finally, Nestor Gomez told a story about immigration, followed by a heartfelt poem about forgiveness. 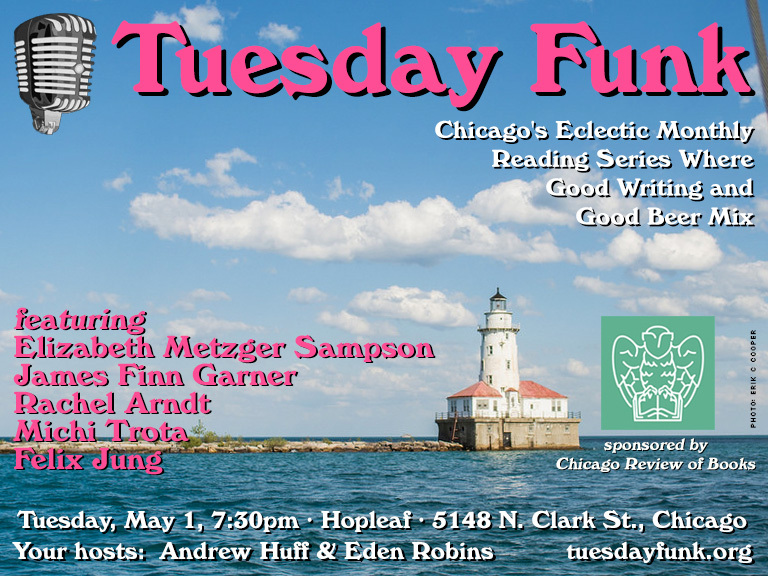 Tuesday Funk will be back at Hopleaf on Tuesday, May 1 with readings by Rachel Arndt, James Finn Garner, Michi Trota, Elizabeth Metzger Sampson and Felix Jung. Hope to see you there! Tuesday Funk #115 is tonight! Emerge from your winter cocoon tonight and come hear some great writing by Tracy Harford-Porter, Nestor Gomez, Kelly Swails, Ruben Quesada, and Levi Todd! Helmed, as always, by your trusty co-captains, Andrew Huff and Eden Robins. 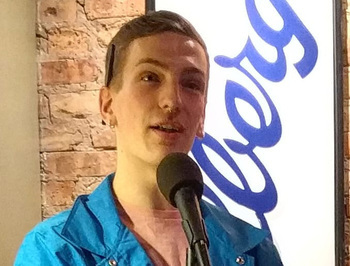 Levi Todd is a queer poet and lifelong witness to the Chicago Renaissance. He is the founder of Reacting Out Loud, an independent organization devoted to uplifting poetry and affirming community in Muncie, Indiana. He is also a reader for Tinderbox Poetry Journal, and his work is published or forthcoming in Glass: A Journal of Poetry, thread, The Broken Plate, and anthologies from Blueshift Journal and Winter Tangerine. You can follow him on Twitter @levicitodd, where he'd love to hear about your favorite Carly Rae Jepsen song. Please join Levi and our other amazing readers on Tuesday, April 3, 2018 in the upstairs bar at Hopleaf. Doors open at 7pm, and the show starts at 7:30. It's free, and 21-and-over. RSVP on Facebook.